Just weeks before our solar system would get deprived of its ninth planet in a hot debate over its proper planetary or dwarf status, we had an almost extraterrestrial encounter with Pluto as well. At the far eastern side of our flat country of Holland, the terrain finally rises well above sea level. Here, living is possible without the endless need for dykes, pumps, windmills and whatever else to prevent the habitat from flooding. Most praise the Dutch for their ingenuity in this ongoing fight against the sea. The image of brave workers assisted by shovels and all kinds of mechanical pumping devices is forever etched in our mental retinas. Only few see the idiocy of pumping away the water from areas that are surrounded by dykes. The result is a continuous sinking and settling of the land and the need for ever-higher dykes. In addition, did you know that the dredged-up peat collected from the same areas they were pumping dry fired the steam-pumping stations of our ancestors? There in that much saner eastern part of our lowlands lives Eddy Driessen. Eddy started Pluto Audio in 1974 with his legendary wood and titanium tone arms. These outstanding tokens of craftsmanship found their way to many lovers of vinyl all over the world. From tone arm to complete turntables proved a small step for Eddy as his never-ending quest for new materials and their qualities in the audio spectrum requires practical outlets. Eddy has investigated and learned much from his daytime high-end engineering job where he works with the most modern and sometimes classified materials and tools used for radar systems. Micro tolerances are nothing new to him nor are non-ferrous materials like carbon fiber. Do not believe Eddy is the proverbial techno-addict hermit and tinkerer. He is a true, rational and warm personality with more than a single hobby. Formula 1 racing is another passion of his, no doubt because of its use and development of the most modern material sciences. Without F1, there would be no widespread use of carbon fiber today, for example. 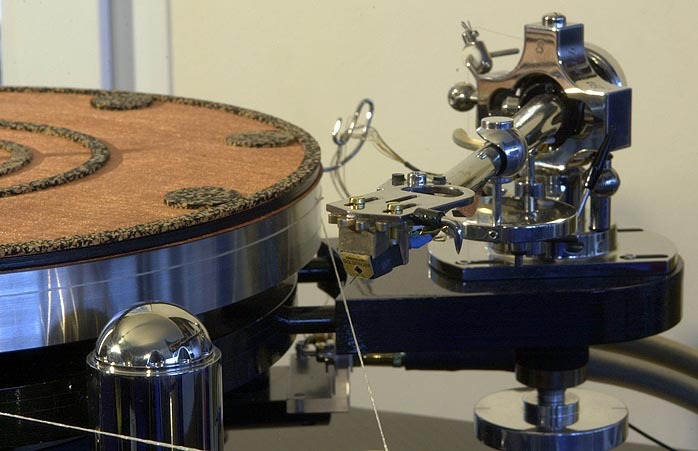 In his work place at home in Hengelo, it takes Eddy roughly 3 months to build a complete turntable. Everything is handcrafted. Only the fabrication of a few larger raw parts is outsourced to a supplier just as is the final polishing process of certain parts. By doing so, Eddy is able to keep up a little with demand. Still, someone who wants a Pluto turntable has to be patient - very patient. We met Eddy at the recent Munich show. 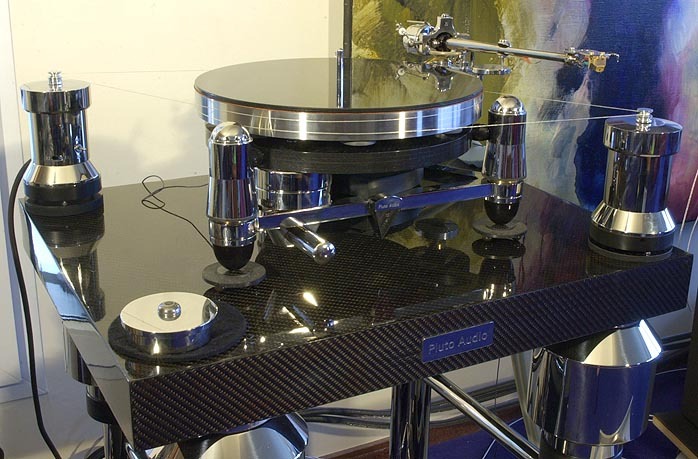 There he offered to visit us and set up a Pluto Audio A10 Carbon Reference turntable with a 9A Prestige tone arm as he had one ready. This rare opportunity to live with such a system was so unique that we needed no time at all to accept the offer. However, this opportunity also put considerable stress on our listening skills. To live with a source of this caliber and accompanying hefty price tag is pretty different from listening to it for an hour or so at a show. Anyway, not long after that happy invitation, Eddy was at our doorstep with a car-full of boxes. 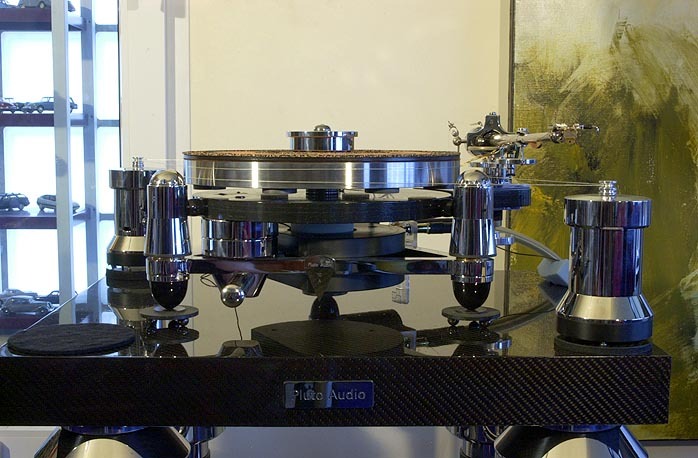 A Pluto turntable -- and especially the 10A -- is not a mere plinth plus platter and tone arm. It is a complete, carefully calibrated system. After hauling the boxes to our listening space, Eddy proceeded to match all the parts together and create a Pluto 10A. There is no such thing as the Pluto 10A although the basic parts remain the same and of the same tolerance. 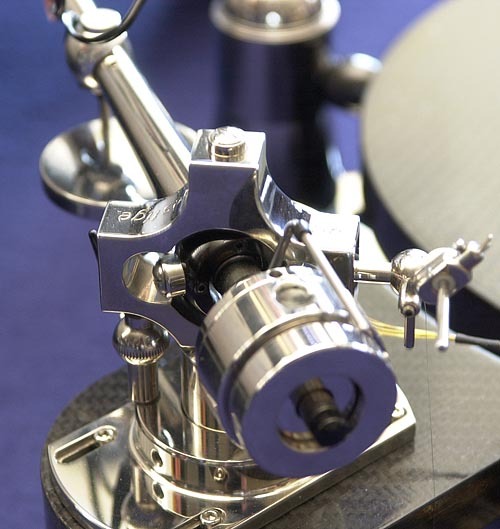 Each installation varies its support with the chosen tone arm and cartridge. First the support. This is a half-meter tall, highly polished stainless steel rack of precision-welded pipes filled with a proprietary heavy compound. The compound ensures that floorborne vibrations are transformed into heat before reaching the delicate equipment higher up. Footers and caps on the support are of a vibration-dampening DuPont plastic. On the four support pillars, Eddy next placed four high-gloss stainless steel cylinders containing -- and now hold on -- one Goodyear air spring each. Any vibration making it up to this level is now transformed by heating up the gas filling the air springs. 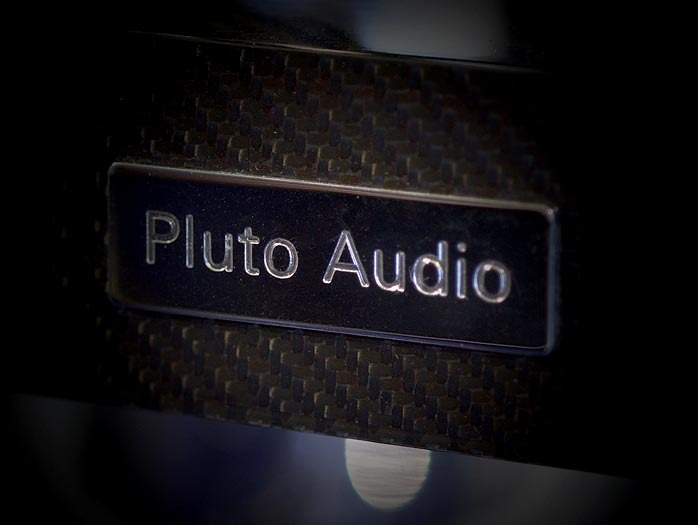 Pluto thus uses high-tech solutions that stem from working intimately with delicate micro instruments outside audio. Atop the four air springs followed the platform. From the outside, this lightweight 5cm thick plate looked to be mere carbon fiber. However, tapping it produced no sounds, neither the one associated with massiveness nor the hollow sound from internal cavities. Eddy explained that inside the top plate resides a honeycomb structure. Is it aluminum like the one used in airplane wings, we ask? No, Eddy uses the real thing -- the one made by busy bees -- and then packs it in carbon fiber. This is nature's absolute high tech. It is however possible to add yet another vibration control insert at this point. The Vibraplane VP2212 Activ brings the combined structure's resonant frequency down to 2.5 Hz. Then from another box emerged the polished stainless steel chassis with its carbon fiber sub-chassis. The beautiful 9A Prestige tone was premounted already to the triangular support, its cartridge sticking out defying danger like a reckless dare devil. The chassis terminates in three feet placed on three ceramic balls each. A small disc between the balls and each footer couples them. This disc is made of jet fighter brake disc material. When you enjoy access to this kind of specialized materials, you should use them. Speaking of materials, Eddy uses bronze, silver, gold, stainless steel, silver steel, copper, rhodium, titanium and tungsten (wolfram) just as easily as carbon fiber, cork, polycarbonate, Peek, Corian, Teflon and graphite. All these materials pour into a 10A turntable and no doubt we even missed a few. 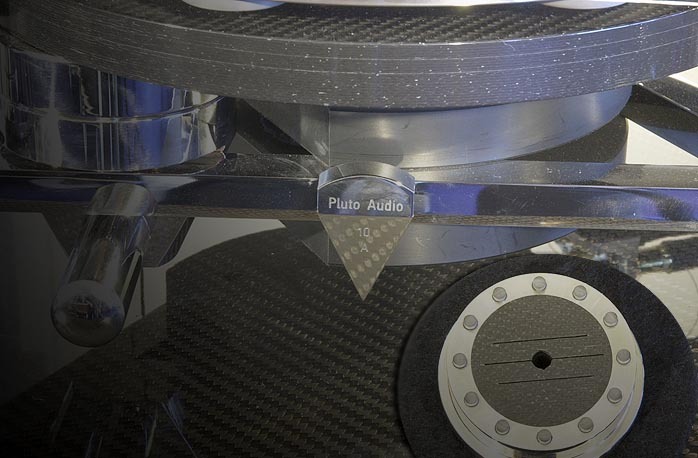 In the middle of the carbon fiber sub-chassis sits the hole for the platter's axle. Creating the sub-chassis is a labor-intensive job. Layer after layer has to be applied, monitoring the structural tensions that can emerge after curing. Eddy now lifted the solid stainless steel platter from its box and showed us the belly. Here all kind of inlays were visible. These inlays not only add to the flywheel inertia of the platter, they also stabilize its construction. What kind of material is used -- it is a metal -- remains a trade secret. From the bottom of the platter, the axle itself protrudes. At the end of the axle sits a pure diamond that becomes part of the bearing. This diamond is not simply a small industrial gem. It is quite a substantial one, which would do well on a ring when cut. With care, our Pluto man placed the bottom of the axle into the hole of the sub-chassis. There it sat, heavy platter high above the chassis, axle still sticking out. It took literally minutes before the platter sank completely down and the diamond reached the bottom to form the bearing. If we are talking about tolerances, this was one of the highest we have ever witnessed by eye. Oil between axle and bearing hole forms a lubricating layer. When the axle sinks down under the load of the platter, the lubricant is pushed upwards by the escaping air from the shank and starts to bubble. Once the platter's axle has reached the bottom of the shaft, an oil film as thick as only a few molecules forms the mechanical separation between the two. The top of the platter sports a highly polished shiny surface but not for long. First, the platter needed leveling. Eddy used a few Van denHul micro levels to measure. The rounded tops of the three feet can be unscrewed to give access to hexagonal adjusting bolts. Only when Mr. Driessen was completely satisfied with the setup's horizontality did he screw the caps back on to the feet. From yet another magic box came two cylinders. One was the 12-volt motor, the other the flywheel. The motor is a continuously adjustable fuzzy-logic controlled DC affair and gained a place on the top left corner of the carbon fiber-wrapped honeycomb platform. The fuzzy logic reflects the motor's ability to adapt to the mechanical load encountered. At startup, it puts out more torque than when maintaining constant RPMs. On the opposite corner, the flywheel found its place. From a little pouch then emerged two DuPont Lycra belts. These belts are 1mm in diameter. The top one gets wrapped around the platter's circumference and the motor's drive wheel, the bottom one connects platter and flywheel. The motor's power cable requires connection to a 12-volt battery. Only a battery power supply would be good and stable enough for Eddie's precision motor. The next step in the building process was -- or better, were -- the mats. On top of the stainless steel platter descended what we first thought was a paper mat. Its color and suppleness strongly reminded us of paper. But no, it proved to be made of finely woven copper wire. Stunned? We were. On top if this copper mat, another mat found its place. Then a 3-millimeter thick slate of carbon fiber with its characteristic pattern formed the top. But wait, there was more yet. From another sleeve, Eddie produced the final mat. This was another woven copper cloth, only now adorned with a sort of cork arrayed in concentric circles and dots. With a big smile on his face, Eddy simply admonished us to wait and then listen why this construction had to be what it is. Fair enough. 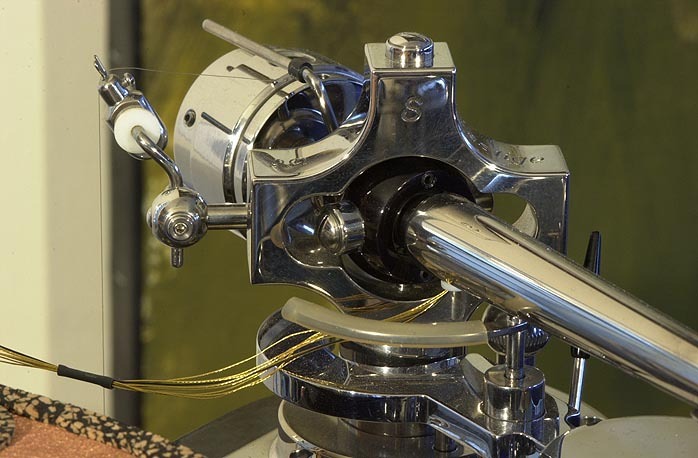 All the attention now went to the tone arm. Upon closer examination, it is incredible how such a thing is even made. Both the arm and its intricate bearing are fashioned from raw titanium blocks. Each detail represents years of experience, trial, error and above all, craftsmanship with micro-tolerance metal working. Eddy not only possesses the skills of an experienced engineer, he could easily make a living as a goldsmith/jeweler. With the 9A Prestige arm, it is not that form follows function by 100%. Aesthetics play just as important a role wherever possible. At the back end of the arm, a bundle of tiny gold wires escape and find it way to the RCA output connectors a little lower on the sub-chassis. In the middle of the beautiful tone arm, we spot the copper antistatic trailer that gently touches the record's surface during play. 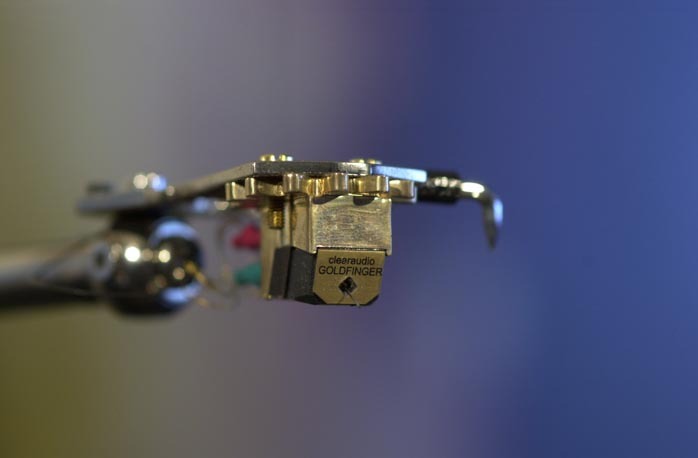 At the tip of the tone arm there's Germany's Clearaudio piece-the-resistance, the Goldfinger cartridge. With an electronic scale, the needle's pressure measured to Eddy's satisfaction and there was no need for any adjustment. Straight out of the box that is! The same went for the anti skating that proved spot-on with a test record's no-groove part. VTA was still fine as the system had already been set up before. A strobe light and a strobe test record confirmed exact speed. Everything regarding the 10A was finally set and ready to go. The next step was to connect it to the system. When we discussed the setup for the Pluto, Eddy offered to bring his own phonostage, an offer we gladly accepted since it is the renowned Cello Suite. Perfectionist as he is, the Pluto man also brought his handmade power cable for between the Cello's separate power supply and the phono preamp itself. 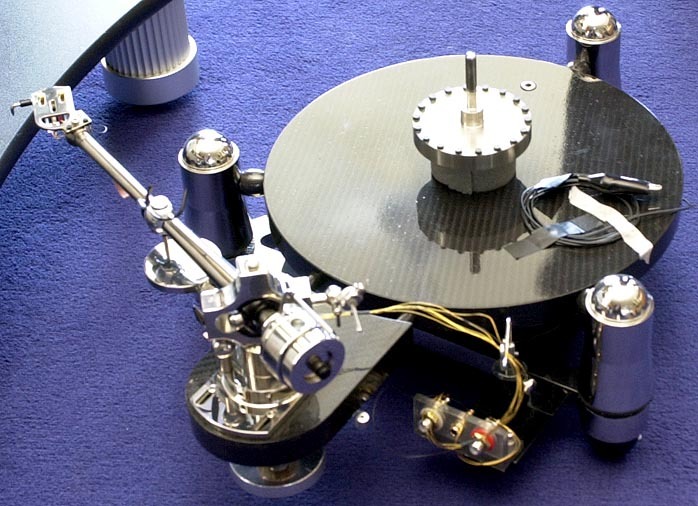 Interconnect between turntable and phono stage was a length of MusicLine cable. The same kind of cable was used to our Audio Note Meishu. MusicLine is Pluto Audio's range of cables. As one expects, these cables are in a league of their own. Inside a 1cm diameter transparent Teflon sleeve, one spots thousands of tiny lead-bearing balls covered in oil. These balls surround pure copper filament, thus avoiding all external influences while still rendering the cables as flexible as can be. The weight then makes the cable immune to mechanic influences. Altogether clever simplicity. When the final connection of a ground wire between chassis and phono stage was made, we were all due for a drink while the electronics warmed up. Over refreshment, Eddy explained how everything we had just witnessed was standard protocol. When you purchase a Pluto turntable, Eddy comes with it wherever you live on planet Earth. It's the only way he can make sure the setup is to his perfection - Pluto style. Following was a special moment for all of us. Eddy had never heard his brainchild over the ultra-sensitive 17-ohm and 107dB Duo Omegas. We had never heard a Pluto in our system. From an old-fashioned harmonica LP case that made the trip to Rotterdam together with the turntable emerged the first album. This is Eddy's reference and very special, a pre-pressing of a Ricky Lee Jones recording. With the LP on the platter resting on the cork rings and dots, the final touch surfaced from the last box, a stainless steel ring to be placed over the LP. Of course, it is no surprise that this ring is also subject to the special Pluto engineering treatment. The underside accommodates a variety of inlays. With the help of a tri-star shaped spacing aid, the ring is aligned over the LP. 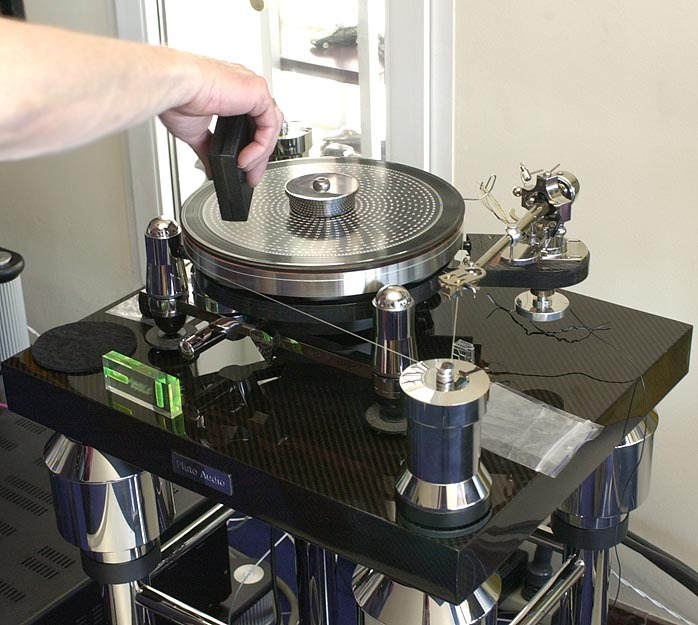 The crowning touch is the heavy-weight and once again inlayed stainless steel puck, coupling the LP as tightly as mechanically possible to the platter. With a flick of the switch on the motor and a little push by hand, the heavy platter started turning. Within seconds, it reached target speed and the delicate needle of the Goldfinger lowered into the groove. The Cello's gain was at -5dB, the Meishu at a level that gets us about 84dB in the listening spot. Cueing with the arm's lift was easy and the downward passage comfortable slow and secure. There's ample time to reach the listening seat before the music commences. We had heard the Pluto 10A at various show, in Holland in combination with KR amplifiers and Von Schweikert loudspeakers, in the US several times in combination with VAC and Duevel just as at the recent Munich show. 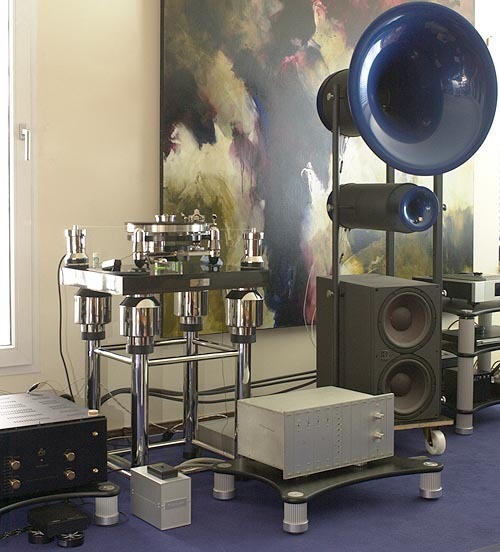 With the knowledge of our own amplifier's and speakers' peculiarities and personalities, we could now concentrate on the A10-A9/Goldfinger/Suite as a complete system for this initial listening session. From the first side of the album, we were simply amazed, in the sense that such a solidity of images and lifelike, almost sweet purity of effortless music could emerge from this combination of equipment. When the needle reached the end of the groove, reality dragged us all back down to a less exalted state. Before Eddy would leave the Pluto system with us, he wanted to hear a few other tracks to make sure all was the way he wanted it to be. Stevie Ray Vaughan's Stratocaster appeared as though direct-coupled to the Duos, the wind from his voice blew from between them. Tommy Shannon's bass notes were tight and true Jazz bass. There was a smile on Eddy Driessen's face. The master thought it good and left. The day after Eddy's visit, we began with admiration just like a visit to a museum where a piece of art needs contemplation and meditation to be able to appreciate its creator's intention and the feeling behind the material that is expressed through the material. There is a very solid concept at work behind the why of Pluto's elaborate support, the use of various components and materials. It must be similar but opposite to location, location, location, the mantra of real estate. Here it is vibration, vibration, vibration and the battle against unwanted forms of it. Audio supports come in a zillion forms and shapes, yet only a few are useful and attractive at the same time. With the Pluto support up to the platform, there is a sense of architectural cohesiveness while being very functional. The turntable itself is far from the modern trend to boxing things up à la Continuum or the excessive use of acrylic. It's heavy metal the way it is used in the best custom bikes - strong, heavy and elegant at the same time. 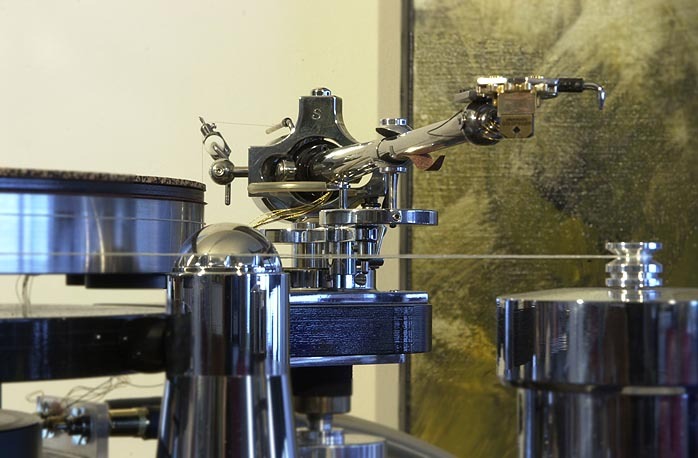 That is also true for the tone arm. A titanium head shell with an über-simplistic grip is attached to the arm's tube. This tube then goes on to the cardan suspension based on century-old ideas by Mr. Girolamo Cardano. Recall that every piece of the arm is handcrafted from a solid piece of metal - milled, filed, drilled, threaded, cut and finally polished before assembly. Minute golden wires lead the signal from the cartridge further downstream. The Goldfinger cartridge is one of the choices Pluto recommends. A reworked van denHul cartridge under the Pluto label is the other option. Looking at a turntable is one thing but playing it is of course much better still. Albums from our own collection and from Eddy's harmonica fold case followed each other, with Jazz, rock and classics abundant and the only genre pitifully absent world music save for some Bob Marley. From all the music rendered via the Pluto 10A Carbon Reference setup -- of course depending on the recording itself and the mastering -- we would soon form a coherent judgment. The sheer solidity of the portrayed image was the first and lasting impression with almost every recording. Music emerged fully detached from the loudspeakers floating into the room. Difficult low frequencies were just as effortlessly presented and the bottom octaves of piano and double bass were simply natural and really low. So far we had never experienced bass reproduction from vinyl with this naturalness. There was no exaggeration, no artificial enhancement or masking. Every tone was built up in an organic way, meaning that the attack was fluent. With digital, attack is often called 'transient dynamic'. A tone is there, emerging instantly from nothing like a flashlight. Here a tone was born, very quickly but not instantly. There was a minute build-up. Moreover, a tone was not born in a vacuum. There was timbre with it from the very onset that enveloped the tone in an integrated coherent envelope of oneness. Attack, sustain and decay followed each other in a natural flow, dependant solely on the kind of instrument and the recording environment. Dynamics are often misinterpreted. A whack can be impressive but is hardly musical. And such so-called dynamics are too often limited to specific frequency ranges. 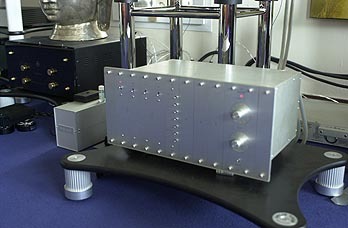 With the Pluto/ClearAudio/Cello as the front end, dynamics were available over the complete spectrum, from way down low to the highest octave and always of one piece. Another observation was the ease the system radiated. Some systems feel like they are reproducing music too fast (seldom too slow by the way) - too fast as though the musicians wanted to go home. That has nothing to do with the exact 33,3333 RPM of a turntable (or the varying RPM of a CD). Those parameters influence pitch, not timing. The rushed hasty feeling comes from a kind of 'internal timing' where notes -- or better, the notes enveloped in their overtones -- are out of sync and balance. With the mighty Pluto, all elementary components of a tone are balanced and perfectly combined. Then the brain can follow the captain's order: sit back, relax and enjoy the journey. To Pluto that is!